Bio: Dale Martin was recognized as a 'Master' by the Pastel Society of America in 2001. He is a Signature Member of the Pastel Society of the West Coast, and Knickerbocker Artists. He paints on location and in his studio, and teaches workshops across the U.S. Among Dale's numerous awards are the Sennelier and the Art Times Awards from the Pastel Society of America, the Eileen McCarthy Award from the Salmagundi Club, and the Board of Directors' Award from Pastel Society of the West Coast. 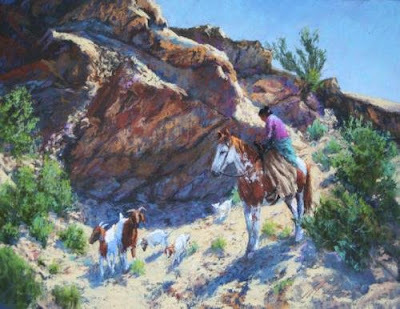 His paintings have been published in Southwest Art, Oklahoma Today, in 200 Great Painting Ideas for Artists and in Pure Color: the Best of Pastel. His work has been included in many private and corporate collections, including those of General Motors, IBM, Oklahoma Natural Gas, and Northwestern University, Chicago. Subjects: Landscapes, Still Life, Figurative. Gallery: The gallery page states that they are four collections to view, but only three are posted: Landscapes; Still Lifes; Figures and Portraits. You may find a larger selection of Dale’s work by doing a web search and finding galleries that display his work , such as the Spiritwind Gallery in Sedona, Arizona. I don’t think the artist has updated the site for some time. Image View: Each gallery opens on a page of thumbnails. These may be viewed (enlarged) individually, or in a slideshow. No information is given as to original size, but the galleries indicate that they are generally fairly standard, ranging from 14 x 18 ins. to 18 x 24 ins. with some non-standard landscape sizes e.g. 10 x 20 ins.